Serving Cork and Munster for over 30 years. We provide a 24/7 service through a highly trained professional team at very competitive rates. 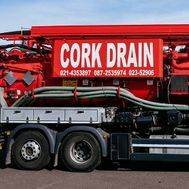 At Cork Drain & Septic Tank Cleaning, we use the most modern and up to date equipment to provide our wide range of services. We are a well-known and trusted family run company and have been operating throughout Cork and Munster for over 30 years. All members of staff are highly trained and qualified, and our fleet of vehicles are fully equipped with up to date safety equipment. Our Staff have extensive experience within the drainage industry, which enables us to offer a complete speciality service for all areas of the drainage business. We offer a high quality value for money service, with flexibility in our range of services and a dedication to carrying out the best job possible at a competitive price. We can be trusted to provide an excellent service for all your drainage needs as we cover all aspects of cleaning and maintenance of drains. Please feel free to contact any of our Staff who will be more than happy to assist you with any query that you may have. 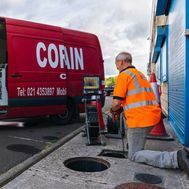 Cork Drain & Septic Tank Cleaning are a local family owned business with over 30 years’ experience and dedicated workforce, providing local employment. 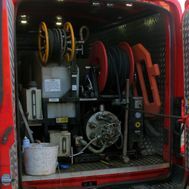 We specialise in CCTV surveys, drain & tank cleaning and septic tank cleaning. We also provide a comprehensive pre-purchase house surveying service to give you added piece of mind before you buy your new home. Sewer Blockages and cleaning Our sewer jetters produce pressures ranging from 1000 PSI to 4000 PSI, with high water flow resulting in superb cleaning performance. Our drain jetters are ideal for removing soap scum residue, grease, hair and food blockages in drains as well as for maintaining and cleaning product conveyance lines. CCTV Pipe Line Investigation CCTV surveying of pipes guarantees our clients to obtain precise evidence of the condition and location of their drainage systems. Locating the problems before they manifest enables us to keep disruption to a minimum and fix any defects or problems quickly. Tracing & Location of Drains When clients are not certain of which way their drains operate, we use drain tracing to locate the relevant pipes. A Sound/Sonar Tracer is used to locate buried pipes and manholes, covered tanks, direction of sewers, etc. Septic tank cleaning A septic tank offers an effective way of treating wastewater from toilets from a house or many houses which are not connected to the mains drainage system. Root cutting in drains Root invasion is a huge issue in drains blocking within the pipework. Tree and plant roots are constantly attracted to a water source; they always endeavour to re-grow, which causes the same issue recurring. Grout removal Cork Drain & Septic Tank Cleaning have cutting equipment to remove all grout, etc. from pipe systems. Home buyer drain testing We provide a service testing the condition and veracity of drains. We have expertise in home buyer examinations and offer a range of survey choices to give you level-headedness when it comes to the state of drains. Insurance work We can carry out all insurance work on drains and septic tank cleaning. Road and power Washing The most effective way to eradicate moss, grime and dirt is by power-washing the surface. 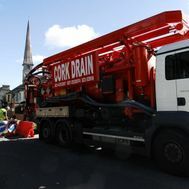 If you would like to learn more about the full variety of drain cleaning services available from the crew at Cork Drain & Septic Tank Cleaning, please do not hesitate to get in contact with one of our members of staff, who will be more than happy to assist you with any queries you may have regarding our services. Just give us a call on 021 4353897 or alternatively you can send us an email at info@corkdrain.ie. We’d love to talk to you.